Probably the last blast here for Wolverhampton’s recently controversial Barbara Hepworth bronze, Rock Form (Porthcurno) – see previous post and many others. But I can’t resist posting this great pic taken just after its unveiling by the Mayor in the Mander Centre shopping precinct in 1968, as the crowd closes in to ponder. Click for full size, and study the faces and body language! Photo courtesy of Pippa Thorneycroft, née Mander, who was present at the ceremony. Thank you, Pippa. “I do not think sculpture can come alive in architecture at all unless it is recognized as a value in its own right. Sculpture is not primarily an embellishment. It gives the human dimension, it gives that added perception which only sculpture can give. […] Sculpture makes people act in a certain way; they move in a certain manner. Their gestures and their reaction to a sculpture are extremely expressive and this is the point – if the architect and the sculptor know how to seize upon it – where one might achieve a vital development in the architect’s as well as in the sculptor’s work in relation to human needs.” (Barbara Hepworth) Copyright P Thorneycroft. 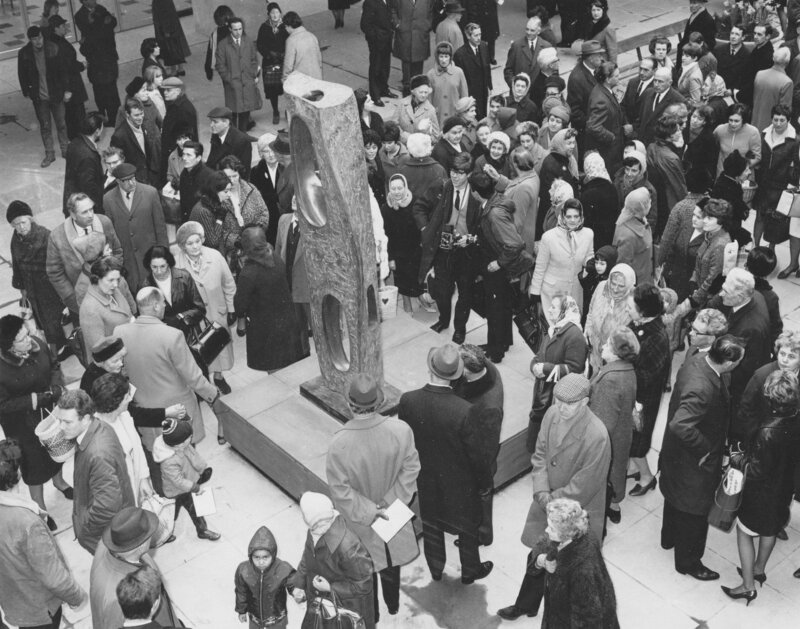 Now that the return to the Mander Centre of Wolverhampton’s cast of Barbara Hepworth’s Rock Form (Porthcurno) has been secured (see posts passim and Facebook here), time for a quick look at the earlier controversy about it – whether it should have been there in the first place – following its unveiling in March 1968, and some of the later echoes. Refreshingly, the terms of argument were not bankers and speculation, but the nature of sculpture and its relation to architecture. And very little of it came from the usual “five year old child” brigade, either. 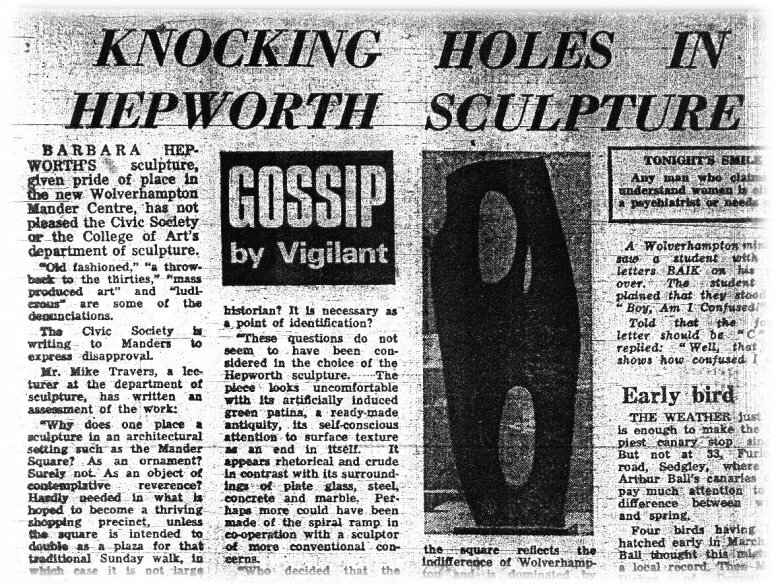 On 3 April 1968 the regular Express & Star “Gossip” column, headed “Knocking Holes in Hepworth Sculpture,” declared Rock Form officially controversial: “’Old fashioned’, ‘a throwback to the thirties’, ‘mass produced art’ and ‘ludicrous’ are some of the denunciations,” announced columnist “Vigilant”. The attack was two pronged, if polarities can be prongs. Wolverhampton Civic Society objected that “a figurative work would have been more appropriate,” and that a local open sculpture competition should have been held. One dreads to think what that might have produced. Three days later, principal Robin Plummer rode half-heartedly to the rescue in the Express & Star’s letters page, attempting to limit damage by judiciously but nervously dissociating his College of Art from Travers and Dutton’s Hepworth-bashing. After saluting Dame Barbara as “eminent” and so forth, he damned the choice with faint praise: “Whether it is fully appropriate to that site is, I think, arguable, but nevertheless it is the right sort of gesture to have made.” All very “sort of”. On April 19th another of Plummer’s lecturers, printmaker Michael North, chipped in briefly to back Travers. After that, it all went quiet. Following a random letter on May 1st declaring the Hepworth “ugly”, the Express & Star seems to have considered the subject closed. Where are they all now? In the intervening years head of sculpture Ron Dutton moved on to become a renowned medallist. His designs are neatly done, but in the main conservatively figurative. As miniature, self-contained reliefs, they do not need to articulate any surrounding space at all. His website is here. 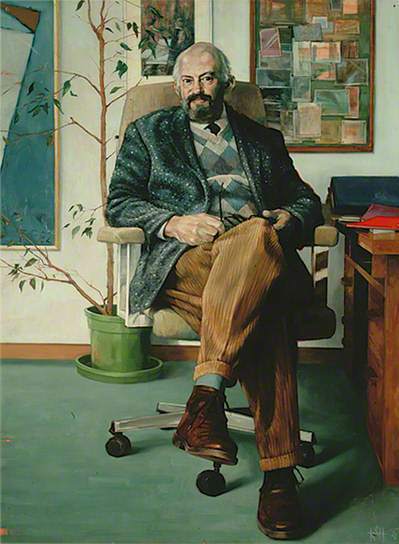 In 1975 Plummer moved on to Brighton, where he taught till 1989. His paintings of the late ‘sixties rely on a simplistic, pop-ish, hard edged abstraction – vaguely jolly but bland, and now interesting mainly as period pieces. Appropriately non-committal, in fact. The Wolverhampton Civic (now Civic and Historical) Society has thankfully progressed from its reactionary stance of 46 years ago, and under the chairmanship of Suhail Rana has given firm support to the recent campaign to save the Mander Hepworth from vanishing. Angry young lecturer Mike Travers became assistant professor at the University of Alberta later in 1968. In 2005 with wife Maureen he was featured in this regional arts magazine – scroll to page 25. 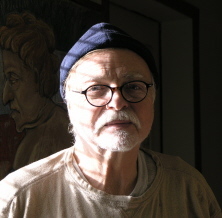 I believe he has recently died, but on a surviving web page here, Michael Travers describes himself as “a visual poet-philosopher with an environmental approach to art and design that incorporates being a bricoleur combined with the philosophy of Wabi-sabi – the Japanese Art of Impermanence.” Evidently, he stuck to his guns right to the end. Permanently, in fact. Good for him. 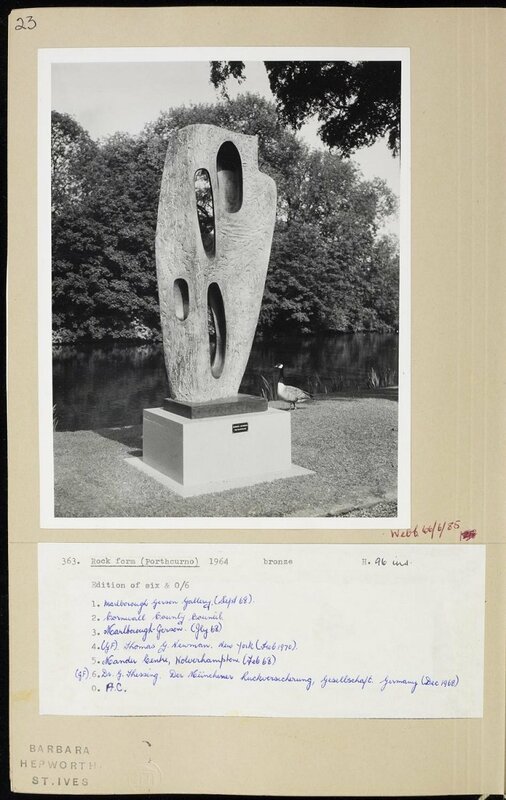 I think Barbara Hepworth would have liked that.